Denny Hamlin currently holds the title of ‘reigning champion’ for two of NASCAR’s most prestigious races: the Daytona 500 and the NASCAR Sprint All-Star Race. Come Saturday night, he will look to continue the strangle hold on one of them, attempting to capture a second consecutive win in Saturday’s NASCAR Sprint All-Star race at Charlotte Motor Speedway (9 p.m. ET on FS1). In order to take home the title, Hamlin will need to navigate the new all-star race format, consisting of two 50-lap segments and a 13-lap dash to the finish. Drivers must make three mandatory two-tire-minimum pit stops throughout the race: one in Segment 1, the second during the break before Segment 2 and the third before lap 85 in Segment 2. A random draw determines whether the top nine, 10 or 11 cars must enter pit road for a mandatory four-tire pit stop prior to the final 13-lap dash. Pit road will be closed for all other cars and pit-road exit will determine the starting order. To start the final segment, those cars that pitted will line up behind those that did not. The new format should cause wild racing in the sprint to the finish as drivers on new tires attempt to catch and pass their peers on old ones, all in the hopes of a $1 million bonus to the winner. 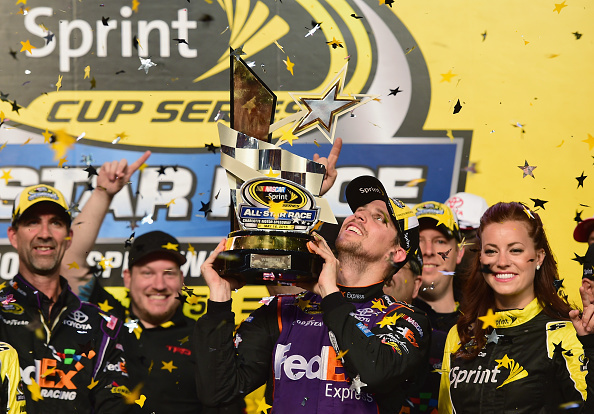 Hamlin’s NASCAR Sprint All-Star Race victory was the first for Joe Gibbs Racing in its 24 years competing in the event. Since then, JGR has been the top team in the NASCAR Sprint Cup Series, winning 19 of the last 36 (52.7%) points-paying races. Further proving his mettle as a big-race driver, Hamlin took the checkered flag in this year’s Daytona 500, winning the race by the closest margin of victory in its history. “As a driver, there’s going to be a lot of strategy played with crew chiefs and drivers,” Hamlin said. “To see how it all works out, we’ll have to see on track Saturday. The NASCAR Camping World Truck Series’ sleeping giant has awoken. 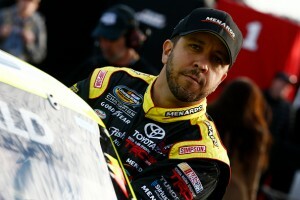 One week after finishing runner-up at Kansas, Matt Crafton produced his first win of the season at Dover International Speedway last Friday. As a result of his second straight top-two finish, Crafton jumped to first in the NCWTS standings, two points ahead of Timothy Peters. In five starts, the No. 11 ThorSport Toyota Tundra driver claims one win, two top fives and four top 10s. Crafton will compete for his second win in as many weeks in Friday’s North Carolina Education Lottery 200 at Charlotte Motor Speedway (8:30 p.m. ET on FS1). The Tulare, California native won his first race at the 1.5-mile track and also owns five top fives, 10 top 10s and an 8.2 average finish in 13 starts there. What to Watch For: Sunoco Rookie of the Year contenders Chase Elliott and Ryan Blaney attempt to compete their way into the NASCAR Sprint All-Star Race. Dale Earnhardt Jr. (2000) and Ryan Newman (2002) are the only rookies to win an All-Star Race. … No driver has ever won the Sprint Showdown and advanced to win the NASCAR Sprint All-Star Race. Michael Waltrip (1996) and Ryan Newman (2002), however, did use transfer spots in the Showdown to win the All-Star Race. What to Watch For: Jimmie Johnson, who owns the NASCAR Sprint All-Star Race record with four wins, makes his 15th career start in the event. … Kyle Busch, Brad Keselowski, Joey Logano and Martin Truex Jr. will all search for their first all-star race wins. Despite never winning the event, Busch boasts the highest all-star race driver rating among active competitors (104.3). … Seven different drivers have won the NASCAR Sprint All-Star Race and gone on to win the Coca-Cola 600 the following weekend. The last was Kurt Busch in 2010. What to Watch For: Daniel Suárez attempts to win his first race after logging his sixth career NASCAR national series runner-up last week. … Christopher Bell goes for his third consecutive top-five finish. … Charlotte native William Byron makes his hometown track debut. … Spencer Gallagher tries to climb from the fifth spot in the NASCAR Camping World Truck Series standings. … Last season’s race at Charlotte tied for the third-closest margin of victory in NCWTS history (0.005). Kasey Kahne edged out eventual NCWTS champion Erik Jones.